May is the FIMFA's month, on its way to the 17th edition! FIMFA presents a program filled with all trends of contemporary puppetry. An aerial ballet for plastic bags, a manipulated giant platform, masks, life-size puppets, objects to satirize the world... everything is possible with this selection of image collectors! This year we also have a special focus on France. Welcome to FIMFA Lx17! 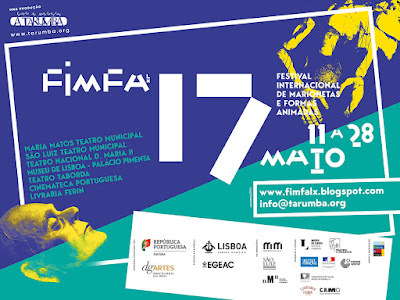 The International Festival of Puppetry and Animated Forms – FIMFA Lx is one of the most important festivals of puppetry and theatre in Portugal. Running since 2001, the festival is programmed and produced annually by the puppet company A Tarumba - Teatro de Marionetas. On the seventeenth edition, running from 11th to 28th of May, the highlights of FIMFA Lx17 will be Familie Flöz, Yoann Bourgeois, Plexus Polaire, Paul Zaloom, Renaud Herbin or Bêtes de Foire, among others. Other activities are also included in the program. FIMFA Lx is an artistic project, open to new tendencies, of international dimension presenting an artistic and technical high-level programme, with a very contemporary point of view. The Festival won the 2010 Critics Award given by the Portuguese Association of Theatre Critics, and the artistic directors, Luís Vieira and Rute Ribeiro, received the Personality Award 2013, by their work on the festival. Since its first edition, confront and innovation are characteristics of this event, by presenting a programme that combines the newest technologies with the most traditional puppet companies, and projects with very elemental techniques, performed in an experimental and contemporary way. In each edition, FIMFA intends to bring together the interest of artists, critics and theatre programmers, creating relations between directors and public, arts and languages, theatre and schools, universities and institutions. Each year are invited a wide range of international companies, from all around the world, to perform in the best theatres of Lisbon, that are also our partners, like the Teatro Maria Matos, Teatro São Luiz, Teatro Nacional D. Maria II, among other spaces. Welcome to the world of puppetry, an art with no boundaries!